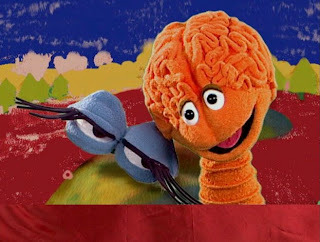 You know I have to be honest.. the first time I watched the Braincandy Five Senses Series I didn't know what to say... I've never seen anything like it so its really tough to compare it to anything else we have experienced. Not that I'm saying thats a bad thing, oh no, but it certainly is a unique quality for a product to leave me completely speechless. Braincandy explores the five senses in a way I have yet ever see a product or even a person tackle. Instead of telling the viewer how something looks, smells, or feels they attempt to show you! I know this sounds odd but seriously they do an amazing job of leaving you wondering and wanting more. The videos are designed for children ages 6 months to 4 years though I would venture to say that that ages one through three would enjoy them most. There is very little dialog in the videos themselves and most of the video is shot in a way that puts you right in the action.. which leaves me to note that the person responsible for shooting the footage itself need some sort of metal as every scene is beautiful and well presented, and every scene is diffrent unlike some other infant DVDS where the set is pretty much the same. The main characters are unusual as well from Bruce the Brain to Mojo Mouth, I personally find the fact that they are all disembodied parts a bit odd, but Connor on the other hand can't get enough of them. For "parts" though they can't be cuter and they really drive home the idea that we use our ear to "hear" and hand to "feel" and so forth. Its a great teaching tool that honestly I would have never thought of! Want to experience Braincandy for yourself? You can purchase the DVDS as well as check out a sample of each of the titles directly on their webpage. I have a full set of Braincandy dvds to give away to one reader! Leave a comment on this post. Go check out Braincandy and look sign up for their kids club. You'll get a 10% off coupon when you do! (Please note, I respect my readers right to not sigh up for the kids club as it uses your email address.. though I would really like you to support our sponsor as they are giving away a VERY nice set of DVDs, out of respect of privacy if you do not wish to sign up just send me an email directly with your email address and the email title "braincandy" and you will still be entered, see my email address below.) Come back here when your done and leave me a comment as to which character in the series is your favorite and why! This contest will end March 14th at midnight! I like Ivy eyes-she's girly. Thanks for the awesome giveaway! I like the Brain character. Emailed you instead of signing up for the newsletter. Thanks! I have never heard of these. I like the hand. I guess the tenacles are feelers. Mojo Mouth is my favorite! Love the name and the DVD trailer for Taste was funny! mojo mouth, well cause the name is funny! !